Johnson’s Underground Sauces are made fresh, by hand, in small batches locally. Rasta-Fire has lots of fresh mango, lime, and scotch bonnets. 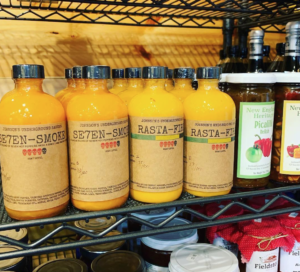 Se7en-Smoke is seven of the hottest peppers you can find with a smoky flavor that will take your breath away! Stop by and try Southcoast Farms Mild, Not Quite Hot Vine-Ripened Tomato, or Mango Salsas. Made using only hand-picked, fresh, ripe fruit in small batches, each salsa offers its own unique fresh flavor to be savored bite after bite on crackers, chips, veggie burgers and so much more!